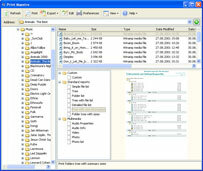 Print file tree and directory content in 1 click with PrintMaestro. All done by an intuitive graphical interface. Lots of printing templates are available: directory printing with sizes, lists of photo (date, exif info), audio (sample rate, bitrate, etc), list of videos (size, duration, width, height, codec). PrintMaestro is very flexible. You can tune templates to your taste. It's so easy to finally know what files you have on your hard drive. Do you often need to print and export the content of your directories (aka folders) to PDF or HTML files? With Print Maestro you can navigate through the directory structure of your the hard disk and print or export the list of files to various formats. Everything is done quickly and easily by means of an intuitive graphic interface devised in the "view and click" style. Qweas is providing links to Print Maestro 2.8 as a courtesy, and makes no representations regarding Print Maestro or any other applications or any information related thereto. Any questions, complaints or claims regarding this application Print Maestro 2.8 must be directed to the appropriate software vendor. You may click the publisher link of Print Maestro on the top of this page to get more details about the vendor.